Description: Erect shrub to 150 cm high, branches white- to rusty-tomentose with stellate hairs. Leaves spathulate to cuneate, rarely oblanceolate, 5–30 mm long, 3–10 mm wide, apex mostly emarginate, base tapering, margins entire and recurved, upper surface ± greyish with long ± simple or sparsely-branched hairs, lower surface white- to rusty-tomentose with stellate hairs. Flowers axillary, ± sessile (on SC specimens) or peduncle 12–16 mm long. 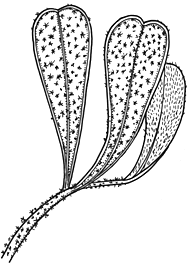 Sepals 6–8 mm long, stellate-tomentose. Petals 6–7 mm long. Stamens 10–15 (sometimes a few reduced to staminodes), surrounding carpels. Carpels 2, hairy. Flowering: spring to early autumn. Distribution and occurrence: Open forest on sandstone; confined to Bents Basin (Nepean R), Yarrowitch district and the coastal ranges south from Wadbilliga N.P. ; rare.